The Yellow-billed Pintail is a South American species, also present on Falkland Islands and South Georgia Island. The nominate race A.g. georgica is found only in South Georgia and named South Georgia Pintail. The subspecies A.g. spinicauda occurs in much of South America and in the Falklands. 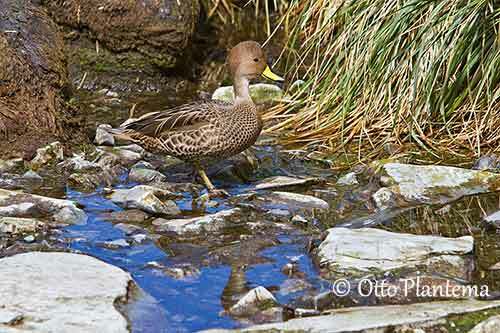 It is named Chilean Pintail or Brown Pintail. The third subspecies A.g. niceforoi from C Colombia is extinct since 1952. The adult has rufous crown with black flecks. Head sides are greyish-brown to buff. Throat and neck are paler, mostly greyish, with paler throat. The upperparts are mainly brown. The feathers show black centres and pale buff fringes. The upperwing is greyish-brown with blackish-green secondaries forming a speculum, bordered pale buff in front and behind. The pointed tail is grey-brown. On the underparts, the breast is rufous-tinged and this colour becomes paler on belly. Underwing-coverts and axillaries are brown. The bill is bright yellow with black culmen, tomium and nail, and pale blue tip. The eyes are dark brown. Legs and webbed feet are grey. The female is almost similar to male. She has duller yellow bill with pale grey to black tip, and duller dark brown speculum. The underparts can be slightly whiter. The juvenile resembles female but it has streaked breast and underparts. There are two subspecies. The third race A.g. niceforoi is extinct. 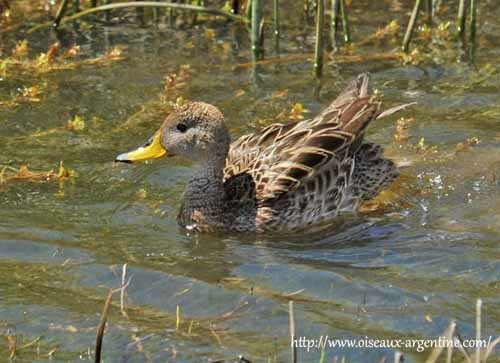 A.g. spinicauda is found from extreme S Colombia, S to Tierra del Fuego and E to E Argentina. It is also present in the Falklands. A.g. georgica is found in South Georgia I. Both races have similar plumage pattern, but the nominate race georgica is darker and more rufous-brown, and more compact than Spinicauda. 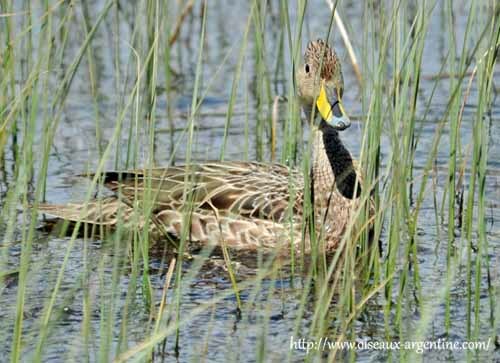 The Yellow-billed Pintail frequents varied wet habitat types such as freshwater lakes and marshes at high elevation, but also rivers and lagoons in lowlands, flooded meadows, sheltered bays on sea shores and estuaries. 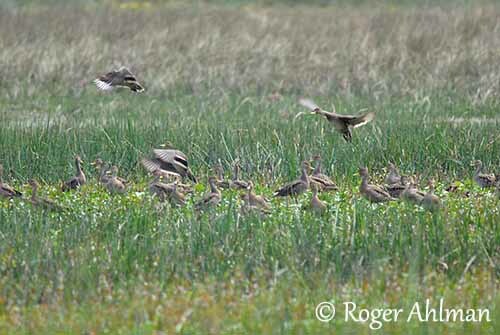 The race georgica breeds in coastal tussock areas with Pia flabellata. The Yellow-billed Pintail is usually fairly silent, but during the breeding season, the displaying males are more vocal. They give a wheezy, deep “geeeeegeeeee” and a mellow trilled whistle. The female gives low “ka-ack” or “qua-ack” which is sometimes repeated. 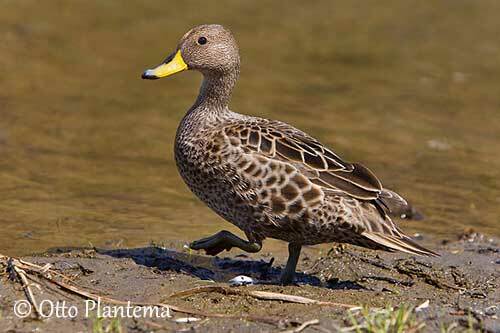 The Yellow-billed Pintail usually feeds mainly on plant matter and aquatic invertebrates. It feeds on seeds, roots, grasses, sedges, algae and various other aquatic plants. It also takes aquatic invertebrates such as crustaceans, molluscs and insects. In South Georgia, the race georgica forages in intertidal areas, in tussock ponds and on sea shores. Its diet includes shrimps, amphipods, and freshwater invertebrates such as dipterans and snails, and marine algae. It feeds by upending and head-dipping in shallow water, including in meadows close to the water. It may sometimes dive under the surface. When foraging on land, it grazes and digs with the bill. The race georgica feeds regularly at night, probably to avoid predators. 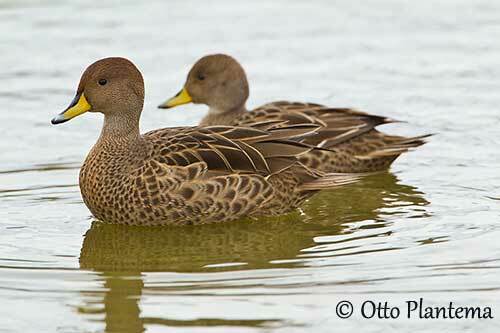 Outside the breeding season, the Yellow-billed Pintail may form loose groups of up to 40 birds after the reproduction. They may gather in compact flocks. This species is common in its range. The southernmost birds of the race spinicauda move north, as far as SE Brazil. The birds living in more temperate regions remain close to their breeding areas. The Falkland’s birds leave the islands in winter. There are some records in other sub Antarctic islands. The nominate race georgica is sedentary. The flight is powerful, fast and agile. When they travel in flocks, they fly in succession. The breeding season varies according to the range. In the Falklands, the laying occurs between September and December. 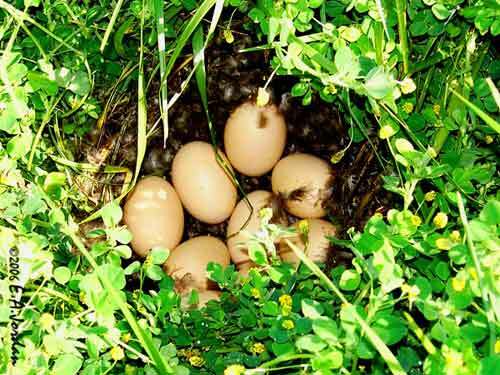 In South Georgia, the race georgica lays the eggs between December and March. 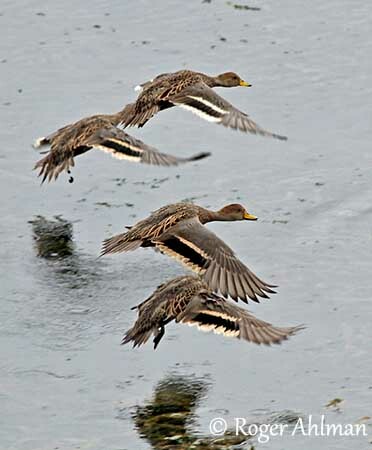 In Peru, the race spinicauda breeds between August and March. Several clutches are produced, 2-3 in places, and 3 in South Georgia. 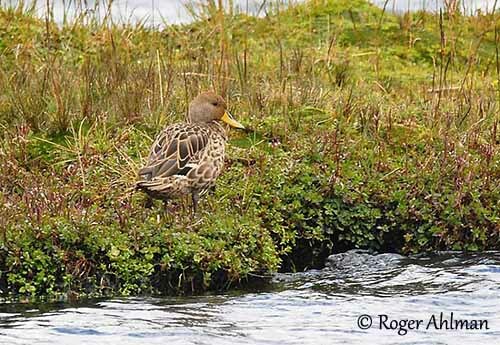 The nest is on the ground, usually well hidden among the vegetation and near water. It is made with grass and stems, and lined with down from the female’s breast. 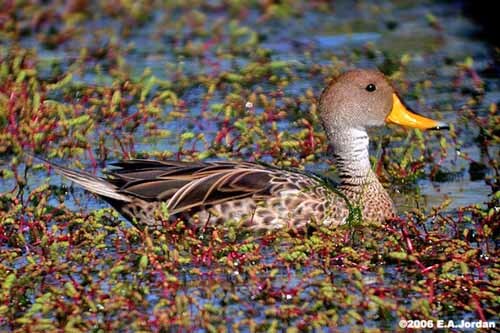 The Yellow-billed Pintail may nest solitary or in loose groups. 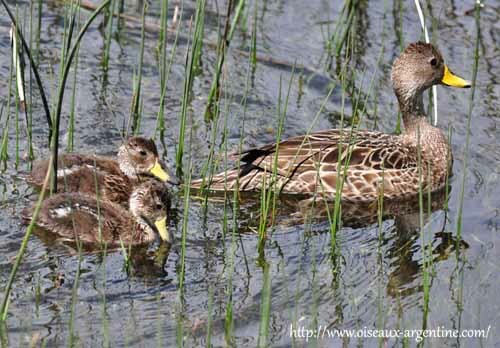 The female lays 4-10 eggs and incubates during about 25-26 days (spinicauda) and 24-28 days (georgica). She is guarded by the male during this period. Both parents tend the chicks which fledge 45-60 days after hatching. They are precocial and go to the water very soon after hatching. They are able to feed themselves, under the protection of the adults. 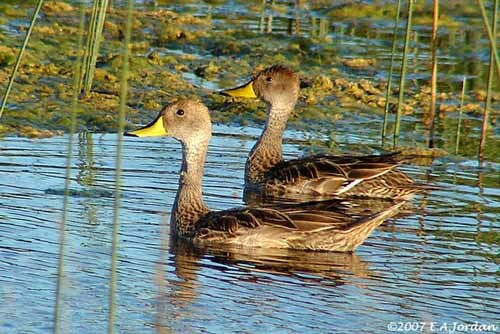 The Yellow-billed Pintail has large range and is common throughout most regions. However, the overall population’s trend is decreasing, but some populations may appear stable. The Falkland’s population is estimated at about 500 breeding pairs. Numbers are well over 110,000 individuals on South American mainland. The race georgica of South Georgia could be between 1000 and 1500 pairs. The Yellow-billed Pintail is currently evaluated as Least Concern.